Complete Coverage of Control and Monitoring SystemsWritten by a veteran electrician with more than 40 years' experience, this practical guide walks you through the ladder diagrams and control devices of networked monitoring systems. 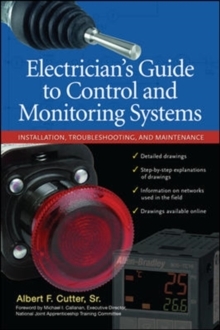 Electrician's Guide to Control and Monitoring Systems focuses on installation, troubleshooting, and maintenance and includes coverage of the 2008 National Electrical Code. Electrician's Guide to Control and Monitoring Systems contains:Detailed drawingsStep-by-step explanations of drawingsInformation on networks used in the fieldDrawings available onlineLadder diagrams are broken down and rebuilt, making it easy to understand the symbols and language used in them. Hundreds of product photos and line drawings illustrate key details presented in the book, and additional drawings are available online. Essential for electrical contractors, electricians, and maintenance workers, this on-the-job resource also contains information on networks used in the field. Foreword by Michael I. Callanan, Executive Director, National Joint Apprenticeship Training Committee (NJATC).